A stunning and vibrant round brilliant cut diamond with scallop set diamond shoulders. This ring shows off round cuts to their most brilliant with the use of claw and micro-claw setting. Opt for a matching scallop set band to finish this set. Love one of our rings but want to discuss a modification? We are delighted to discuss your ideas and quote for bespoke styles. You might like a plain band instead, or simply have it made in two metal colours to make it extra special. 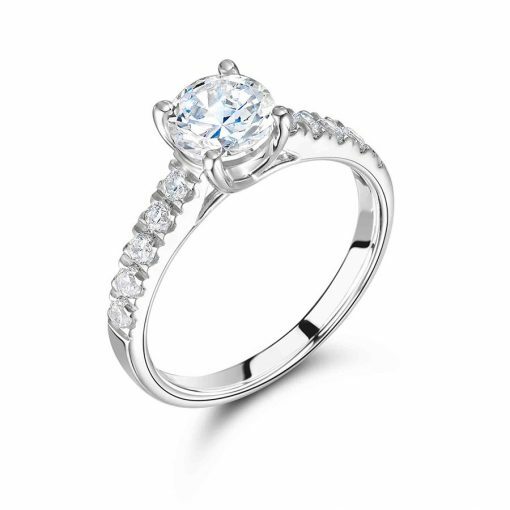 Voltaire Diamonds can customise this ring for you starting from approximately €1,500 and will advise you on the quality of stones available to you.